Arsenal midfielder Lucas Torreira has given some insight into how manager Unai Emery helped the team turn things around in the win over Tottenham yesterday. 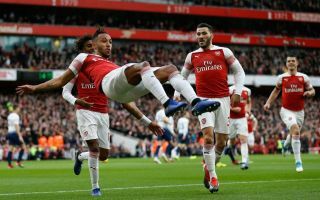 Despite trailing 2-1 at the break after another suspect opening to a game, the Gunners came back to win 4-2 in the second half of a thrilling North London Derby at the Emirates Stadium. Torreira scored Arsenal’s fourth in a superb performance in the second period, with the Uruguay international generally looking an inspired signing by Emery in his first summer as Gunners boss. The player himself, however, paid huge credit to the manager after the result, praising his half-time team talk for helping the players keep their cool and win yet another game due to a strong showing after the half time interval. This has been a mark of Emery’s time at Arsenal so far, and it’s clear Torreira rates the Spaniard highly for the way he set the players up. “[Emery told us] to be calm, to continue playing because there were 45 more minutes left, that we keep attacking because obviously in the second half we were going to find more spaces. In fact, it happened and we scored the goals at key moments,” Torreira told ESPN after the game. “In the first half we started very strong, pressing very high, sometimes we managed to steal the ball very high we had many chances after scoring the first goal. “Then, for different reasons, because of football too, they scored two goals and went ahead.